Masonry paint can make or break the curb appeal of your property. In fact, few other features of a home have such an immediate visual impact like the exterior paint job. Cured details and a flawless finish can define your home’s personality and make a statement in the neighbourhood. 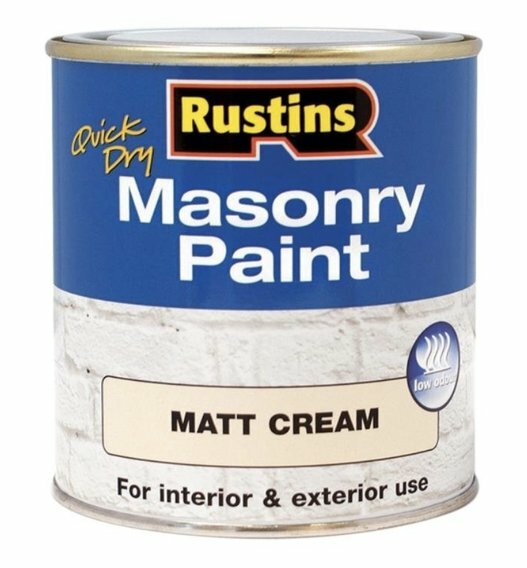 But what are the qualities of good masonry paint? With so many products available, how can you choose the best one for your home exteriors. Don’t worry! To help you identify the best exterior masonry paint in the UK, our expert team has tested and rated some of the most popular brands on the market. Check out our top picks below. 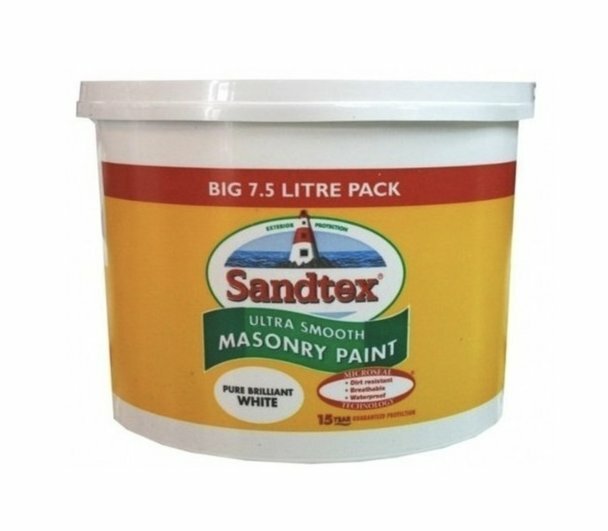 What is the Best Masonry Paint For Render? Our best pick masonry paint – a high-performance paint formulated to resist harsh weather and withstand the test of time. A quality low-cost paint – provides weather resistant shielding for up to 10 years. Great value for money. A high-quality paint, best-suited to large scale renovations. Covers up to 16m² per litre with a stunning finish. One of the most expensive paints on the market but has a high-quality finish. Dries fast & no primer needed. Acrylic finish with weatherproof technology. Suitable for brick, walls, concrete & plaster. Low coverage. 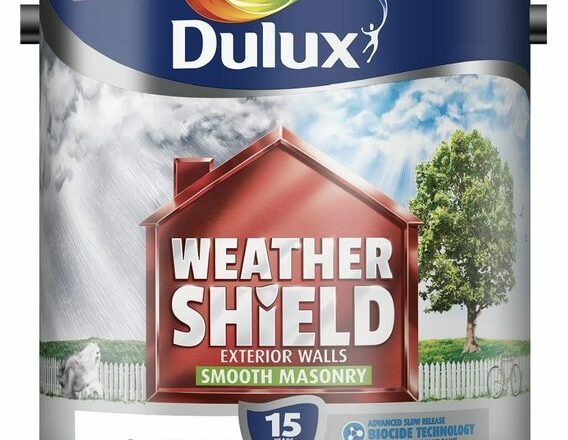 Mould-resistant with up to 10 years of exterior protection. Suitable for all types of masonry. 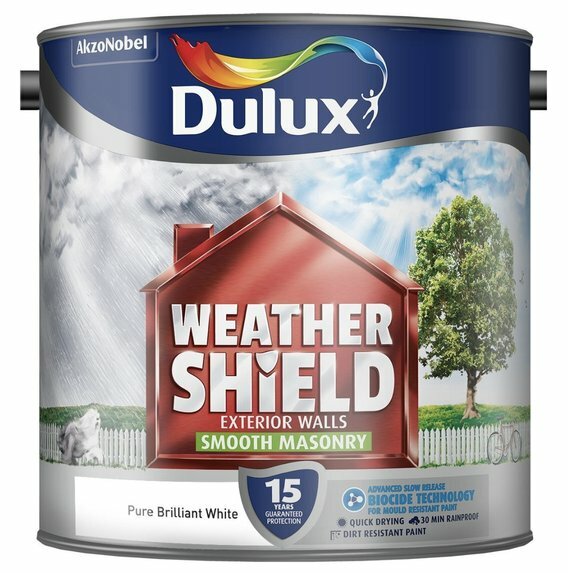 Dulux Weather Shield is a versatile masonry paint formulated to resist harsh weather, but this product is our top pick for a bunch of other reasons too. Weather Shield is made with a unique high-performance acrylic resin that ensures a flawless finish and long resistance over time. And the advanced slow release biocide technology keeps the paint looking fresher for longer. One of our favourite features is the quick dry time. Tested under adverse weather, the paint dries to touch in less than an hour and accepts a second coat after about four hours. But that’s not it! The product waterproofs itself after about 30 minutes and won’t run off even if it’s raining. Do note however, that for consistent results, we recommend applying the paint in dry conditions when temperatures exceed 10°C. Weather Shield is easy to apply. It adheres to almost all masonry materials and provides an excellent coverage without the use of a primer if applied to a bare wall. The manufacturer recommends applying the paint on a stabilising primer if the product is applied over previous paint, to ensure its adherence. Another feature we like is the product’s resistance to flaking and peeling. This paint maintains a flawless aspect over time while the slow release biocide resists mould and staining. The manufacturer stands for the quality of the paint, promising to return the value of the product if the paint film doesn’t last for “as long as you live in your home”. Although this claim seems commercial, it’s still worth it to register and use the product within 6 months of purchase, just in case. High-performance acrylic resin resists flaking and peeling. The product provides a flawless coverage that lasts for years and a litre of paint covers up to 9m². Advanced slow release biocide technology resists mould staining and maintains the fresh look of the paint. This rainproof paint is easy to apply in almost all weather conditions without running off the walls. The product is also UV-resistant. Applied in dry conditions with temperatures above 10°C, the paint dries in less than an hour and accepts a second coat after four hours. Registered products used within 6 months of purchase benefit from a money-back guarantee. Coming in 2.5L or 5L tins, the paint is smooth or textured and available in a wide range of colours. The product is not suitable to use on common or Fletton bricks. Paint tin is covered with a flimsy plastic lid that can break open easily. 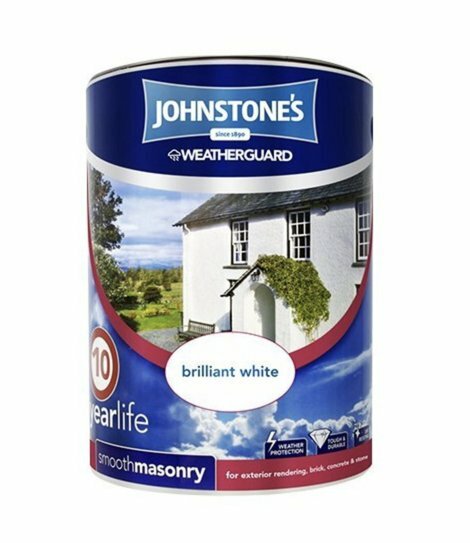 With a high-quality formula that provides up to 10 years of protection, Johnstone’s is a smooth masonry paint well worth consideration. The product is compatible with almost all exterior surfaces, including rendering, brick, concrete, stone and other similar materials. This paint has a satisfactory consistency and is thick enough to cover all tight crevasses. Moreover, it comes in a wide range of colours. But the main advantage of this paint is its affordability paired with an outstanding quality. The paint dries to a smooth weather resistant finish that prevents dirt accumulation, while the durable and flexible formulation allows a proper surface expansion and contraction, preventing flaking and peeling. Coverage is also excellent. One litre of paint covers up to 10m² and a 5L tin is enough for most home restoration works. For surfaces larger than 50m², we recommend mixing two or more tins of paint in a container to ensure colour consistency. We also like that the paint is easy to apply. A primer isn’t needed if the paint is applied to a bare wall; yet, for longer lasting results or for applications over previous paint, a primer might help. Smooth finish masonry paint formulated to provide up to 10 years of protection. It is suitable to use on most exterior surfaces. Budget-friendly paint covers up to 10m² per litre. Easy to apply, Johnstone’s is touch dry in an hour and accepts a second coat in four hours. Proper viscosity ensures a perfect coverage of all tight crevasses and small cracks. Coming in nine different colours, the paint is easy to match with the landscape. At least two or three coats of paint are needed for proper coverage. Sandtex Ultra Smooth is a high-quality exterior masonry paint to consider for large renovation works. This product provides an impressive coverage of up to 16m² per litre and boasts a quick drying time, allowing for a second coat after about four hours, depending on temperature and humidity. Adhering effectively to almost all masonry materials, this paint has a smooth weather and dirt resistant finish while the Microseal technology improves the paint’s breathability. These qualities ensure a flawless look over time, while mould development, flaking and peeling won’t be an issue. The paint comes in only one colour, and while it’s impossible to consider this characteristic a flaw, we admit it’s limiting. Dyeing the Pure Brilliant White in another hue is possible, but it’s hard to guarantee consistent results unless you’re an expert. Coverage is reduced on rougher surfaces, but it’s still great. In the worst-case scenario, 7.5 litres of paint will cover an area up to 90m², so this is a great paint if you don’t mind white walls. Microseal technology provides dirt protection and ensures breathability. The paint is waterproof and weather resistant. Sandtex guarantees up to 15 years of protection; the product is easy to apply and is compatible with almost all masonry materials. Quick dry time makes application smooth and easy. A second coat is accepted after approximately four hours, depending on temperature and humidity. A bucket of paint covers up to 120m². The paint comes only in Pure Brilliant White. Coverage is reduced on rougher surfaces. Rustin’s Quick Dry Masonry Paint looks like an affordable product at a first glance, but don’t let the low retail price fool you. Coming in 500ml tins, this is one of the most expensive paints on the market. However, if you’re willing to pay for quality, this product can satisfy your needs. This quick dry and high-performance paint dries to a smooth matt finish in about half an hour, depending on temperature and humidity. It accepts a second coat after about four hours and it has an excellent coverage of up to 14m² per litre. Given the low volume of the tin, the product is more suitable for small projects, but the paint adheres well to almost all masonry materials. And it doesn’t require a primer when applied to fresh mortar or clean bare walls. The product is easy to apply with a paintbrush or roll and it has an excellent coverage. One coat is enough to achieve a bright, flattering result, while Matt Cream is a luminous shade that blends well in most landscapes. If you don’t like the colour, the paint also comes in other tonalities. The product is suitable for interior and exterior use. Rustin’s Quick Dry masonry paint has an excellent coverage and is suitable for interior and exterior use. Paint is easy to apply on clean and dry surfaces; no primer required if applied on fresh mortar. Acrylic paint dries out fast and accepts a second coat after about four hours if needed. This product dries to a smooth matt finish. Coming in 250ml or 500ml tins, this product is ideal for retouches or small painting works. It comes in Matt Cream but the manufacturer proposes other colours too. The colour is lighter than expected and dries to almost white. This paint is expensive and similar quality is easy to find in more budget-friendly products. HQC is a 100% acrylic product manufactured with leading weatherproof technology. Its special formula provides ultimate protection to masonry thanks to the high-quality acrylic resins included, delivering unrivalled durability and long-lasting shielding against extreme weather. The paint adheres to almost all masonry materials, including stone, rendering, brick and concrete. Suitable for both exterior and interior use, the product adheres to plaster too and is easy to clean with a damp cloth or soft sponge once dried. A durable finish that resists abrasion and peeling reduces maintenance requirements while the wide range of colours add extra versatility. But the feature we like best is the environment and user-friendly formula with a low content of volatile organic compounds. The paint is safe to use in enclosed spaces with minimal or low ventilation. The paint is dry to the touch after about two hours, but it still accepts a second coat after only four hours. A slight drawback is the product’s coverage. A litre of paint covers up to 6m²; though easy application counterweights this flaw, and the product can be applied with a paintbrush, roller or sprayer. 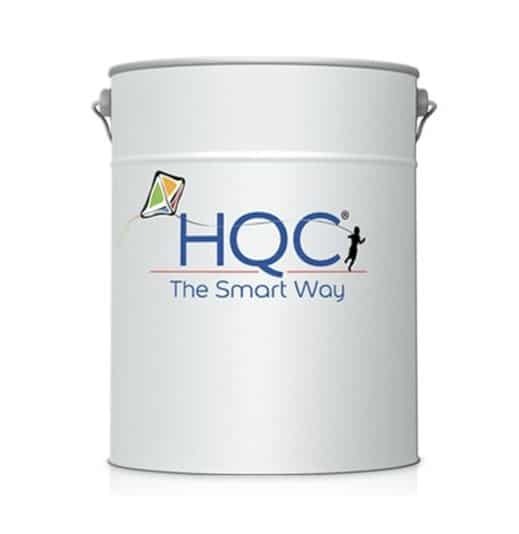 Suitable for interior and exterior use, HQC paint adheres to almost all masonry materials including pebble-dash, plaster, brickwork, stone, concrete, and more. 100% acrylic product is weather resistant, water repellent and easy to wipe-clean with a damp cloth or soft sponge. Finding the right colour is easy. The product comes in thirty-six hues that dry to a matt smooth finish. Low content of volatile organic compounds allows the paint to be used in enclosed spaces with minimal or no ventilation. Easy to apply with a paintbrush, paint roller or sprayer. It’s necessary to apply a primer to the surface before painting; this has an impact on both the length of the project and cost. One litre of paint can only cover up to 6m². Colours often dry lighter or darker, depending on the hue. 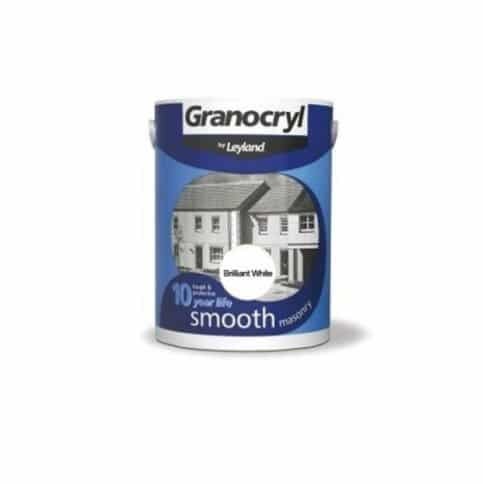 Leyland Granocryl is another excellent masonry paint. 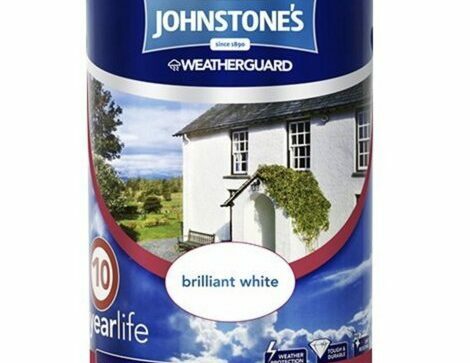 It boasts a mould resistant formula and superior elasticity that ensures a long-lasting result – while the paint provides up to 10 years of weather protection and dirt resistance. The smooth, elegant finish is suitable for a variety of surfaces including concrete, brickwork, rendering and similar masonry materials. The elasticity of the dried paint allows for an optimal surface expansion and contraction, making the product resistant to flaking and peeling. As for the colour choice, the product comes in eight natural shades and earthy tones that easily blend into your landscape. Coverage is also excellent. On unpainted surfaces, a litre of Granocryl covers up to 8m² and on previously painted surfaces the coverage rises to 13m² per litre. Overall, the product has a satisfactory quality, but it lacks breathability. Wall sweating is an annoying issue and subsequent formation of mould can occur if the paint is not applied over a primer. If you don’t mind the extra work, this is a good paint to consider. Affordable and good quality paint that provides excellent coverage and outstanding durability in all weathers. Mould resistant formula is suitable for a variety of surfaces including rendering, bricks, roughcast, concrete and similar masonry materials. Easy to apply with a paintbrush or roller. Thinned paint is suitable to apply with a sprayer. One litre covers up to 13m² when applied to previously painted surfaces. Matt smooth finish prevents the accumulation of dirt while elasticity allows an optimal surface expansion and contraction, preventing flaking. Granocryl is suitable only for exterior use and should be applied over a primer. The paint’s breathability is an issue. Painting render is not as simple as it seems. The job requires a specific exterior masonry paint capable to act as a shield, preventing water infiltration in the wall. Thickness, resistance and elasticity are key features of the best masonry paint for render, but long-term protection and low maintenance are also important characteristics. In render paint, thickness equals protection. Standard exterior paints have a thickness of about 50 microns, but a few so-called membrane paints boast specific formulas and thicknesses up to 170 microns that protect render from weather and elements. More often than not, thickness also guarantees weather resistance, an important feature of exterior masonry paint. In fact, render is not effective in preventing water infiltration on its own and relies on paint to repel moisture. Aside from this, the best paint for render also has to be dirt and mould resistant. Top-rated masonry paints have formulas that prevent both the formation of mould stains and the infiltration of water, two features that boost the product’s durability. Maintenance is another thing to consider when choosing masonry paint. A good product should last for at least 10 years and require a minimal maintenance routine as long as the paint has been applied as instructed. Certainly, the colour of the paint and the location of the home can change this timeframe; darker colours and coastal properties may require more frequent retouches or restorations. A fresh coat of paint can bring to life an exterior masonry wall, and correct application of the product is key to the success of your project. Diligent preparation work is critical to a flawless finish. If you’re painting on fresh masonry, leave the material to cure for at least 28 days or the paint may not adhere well, leaving a dusty finish. When repainting a previously painted wall, power wash the surface to remove old paint and debris before applying the fresh coat. Dust and debris may interfere with the new paint, preventing its adherence. If present, mould has to be removed with a chlorine or bleach solution before cleaning the surface. Most masonry paints available on the market are thick enough to cover fine cracks, but large cracks or surface defects will affect the durability and efficiency of the paint. To guarantee a flawless finish and long-lasting result, seal any cracks or joints with caulk and cure it before applying the paint. This is optional, and it might be an unnecessary step if you’re painting a bare wall with a high-quality product. However, we recommend sealing any previously painted surfaces with a suitable primer before applying a fresh coat of paint. The primer provides a base for the new paint, helping it adhere to chalky or dusty surfaces. Good exterior paint is 100% acrylic, but not all paints are suitable to apply on all masonry materials. Most products available on the market are compatible with almost all materials, so finding the right paint should be easy. When choosing the paint also consider its versatility. Some exterior masonry paints are also suitable to use for the interior, but they have a poorer resistance to weather and elements. The colour is another aspect to consider. Neutral colours are easier to integrate into a landscape and last longer. Darker shades need more frequent retouches and maintenance. The ideal way to apply masonry paint is with a paint sprayer. This tool spreads a thin and even layer of paint, helping you finish work in a breeze. For a professional-looking result, the spraying and roller method is even more effective. This method requires two people, one that sprays a thin layer of paint on the surface and another that runs a paint roll over the coat to deliver a smooth and even finish. A paint roll alone can also provide consistent results but it takes longer to finish the project. It’s not recommended to use a paintbrush to apply masonry paint unless you don’t mind the unflattering result of poorly applied product. It’s also important to cure the paint before applying a second coat. In broad terms, masonry paint dries in an hour or less and allows for a second coat after about four hours, subject to temperature and humidity. Depending on the climate, a flawless masonry paint job performed with top-rated materials can last up to 10 years, and sometimes even longer.